A few days prior I had stopped into Cocina Vasquez because I was eager to try the chicken mole tamales, which are only available Wednesday and Thursday. The place was inexplicably closed. I panicked: I've heard a few people speak of this place favorably and it worried me that sometimes even good food has trouble surviving in the business hellscape that is food service. But worries assuaged, it was open! The teenage girl at the counter said her family, who runs the place, had to make a trip to get supplies that day. She also confirmed that Cocina Vasquez owners are related to the owners of Viva Cinco de Mayo over at Madison Ave... and then she promptly returned to her calculus homework. The surge of Mexican culture in the Albany restaurant scene -- specifically from southern Mexican states such as Morelos, Puebla, and Oaxaca -- really instills a sense of pride within me that the Capital Region is still welcoming to immigrants and newcomers and is a place where a family can support and express themselves (there is a portrait of Emiliano Zapata hanging inside Cocina Vasquez) while cooking the cuisine they know best. And what they know how to do is make a mean black bean sauce to serve with eggs. 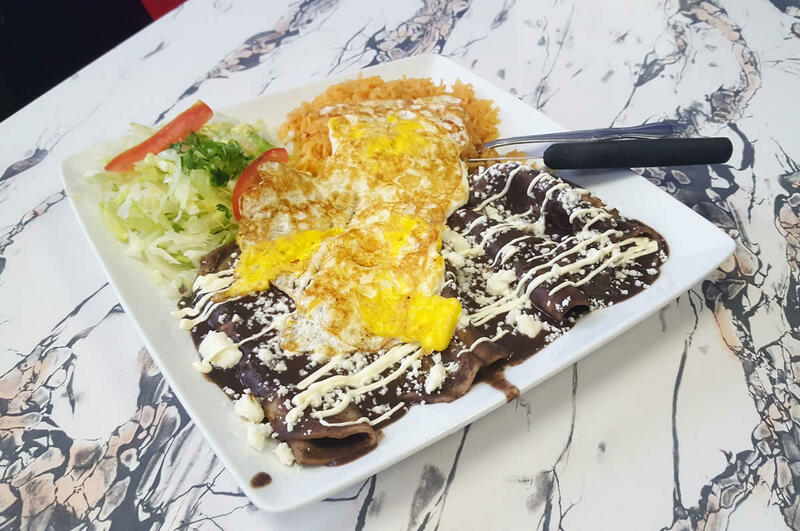 The enfrijoladas de cecina I ordered ($11.50) came with salted and dried beef (at the recommendation of said daughter-staffer) under five warm and folded white corn tortillas which are smothered with a black bean sauce which was nearly as thick as refried beans. The beans themselves really stole the show. Pungent and rich, they tasted of oregano, chili peppers and epazote (a Mexican herb sometimes referred to as a tea, though it has a slightly smoky mint-anise flavor best used in cooking). And it was surprisingly spicy. 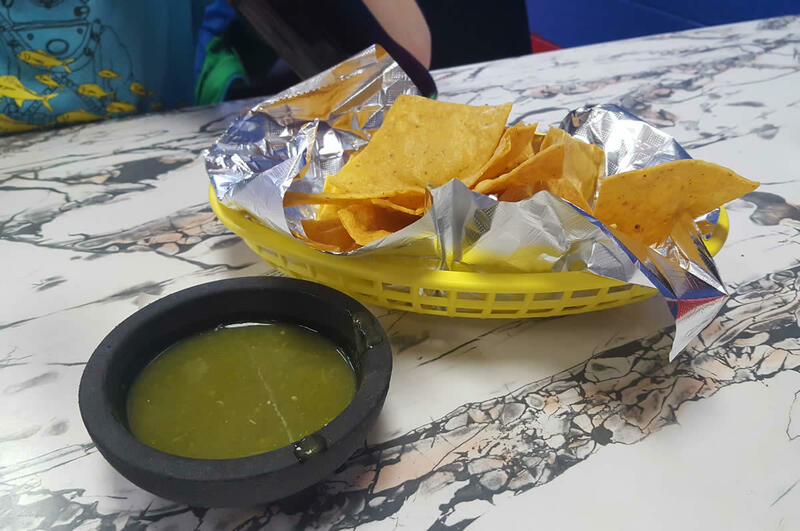 The green salsa that is served with fresh tortilla chips when dining-in was enough to make my eyes water and breathe in deep, letting brisk air pass over my tongue and cool my mouth. I thought perhaps I was just experiencing some after-burn, but the heat from the beans was more round and less sharp. A Pollock-style drizzle of sour cream and crumbles of queso fresco was a visual and gustatory contrast to the beans, beef and tortilla. Seasoned rice, as well as a salad of shredded iceberg, tomato, and cilantro filled the rest of plate (enough for two servings) and two over-hard eggs topped it all. 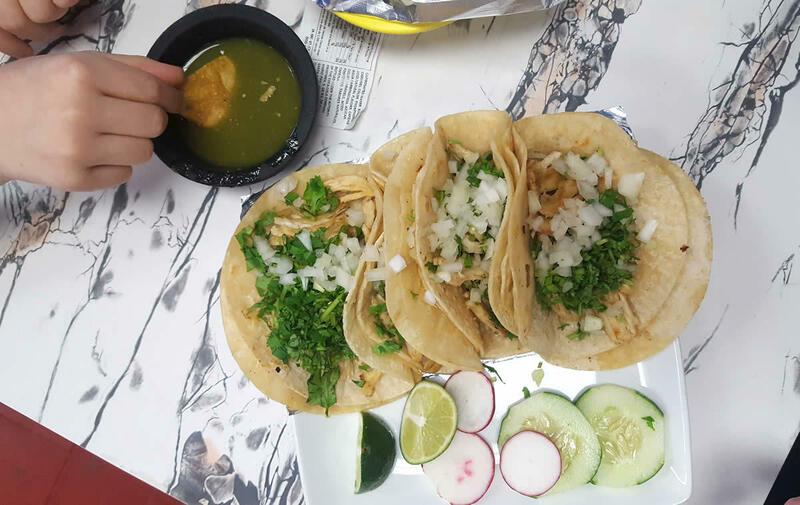 We also ordered chicken tacos -- a simple preparation of pulled chicken, chopped white onion, and heavy-handed cilantro (which we were given the option to omit -- no thanks) served with rounds of radish and cucumber with lime wedges and a red chipotle sauce that was less piquant than the green salsa. Two Cokes and a seltzer brought the bill to $31.86 before tip. 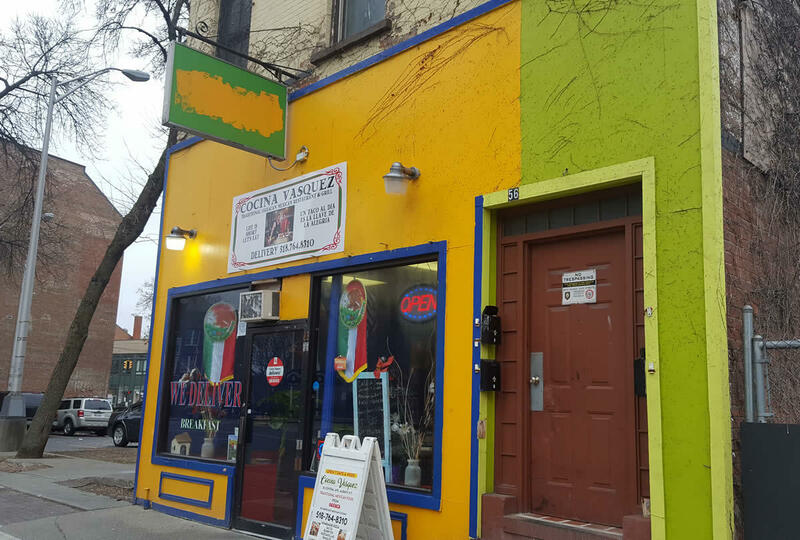 Of the new crop of Mexican restaurants in Albany, Cocina Vasquez is the most assertive in what it serves and how the food is seasoned. No accommodations are made here, and I'm eager to stop in again to try the rest of the traditional, fiery menu and support a local family business.